The results have been announced for this year's Prima Baby Awards and it's been another great year for Obaby and ABC Design. We've managed to earn 3 medals and 3 shortlisted awards between us - out of the hundreds of entries, that's quite an achievement. Take a look below at the winning products - all of which are available to purchase now. The ABC Design Takeoff is an extremely lightweight and compact stroller which is perfect for everyday travel. Folding to a size of 50 x 49 x 39cm, the Takeoff is the ideal size for effortlessly placing in your car boot. With its adjustable seat unit and bumper bar, you can adjust the Takeoff to make it perfect for little one and its UPF50+ hood ensures they're always protected. If you want to use the Takeoff from birth, the ABC Design Risus Group 0+ infant car seat attaches effortlessly and makes the Takeoff not only ultra portable, but extremely practical. The ABC Design Cobra adds yet another award to its name after winning 2 Silver Awards in last year's Loved by Parents awards (Best Stroller, Best 3 Wheeled Pushchair). Its 3 position, parent/forward facing seat unit offers great versatility from 6 months, but when paired with the Risus Group 0+ infant car seat, the Cobra becomes the perfect, from birth travel system. Its 3 large wheels offer ultimate manoeuvrability while its height adjustable handle and suspension make it as comfortable for you as it does for little one. The Obaby Lincoln Mini Sleigh cot bed can effortlessly change between being a cot bed, junior bed and a day bed and provides a practical storage solution with its subtle under drawer. Available in a range of finishes, it's elegant, curved scroll design and slatted sides will look perfect in any nursery. To make your room look even more perfect, why not add the matching Lincoln double wardrobe and closed changing unit? Although not quite good enough to take the top spots, our last 3 items made it to the shortlisted stage showing that they're still some the top products available to purchase at the moment. Being the first awards for the Obaby Zeal, getting shortlisted is quite an achievement. This multi function stroller that grows with your baby is the perfect from birth environment for your little ones. For even extra from birth usage, there are optional Group 0+ car seats and carrycots that make the Zeal even more versatile. The Obaby ZeZu Multi and ABC Design Zoom are award regulars and between them hold 15 awards (6 Gold, 5 Silver and 4 Bronze). Whilst both of them are for multiple children, they are both completely different. The ZeZu Multi is on its own a perfect from birth pushchair with a parent/forward facing seat unit that effortlessly converts into a pramette. With the addition of the Tandem Kit, the ZeZu then offers either a second seat or a ride on board with support handle. The simplicity of the design means it can be converted from pushchair -> pramette -> tandem or any combination with ease. The ABC Design Zoom is the only tandem that offers true face to face interaction for children which is why it is perfect for twins. Its German engineering and solid construction mean that although it is large in size, its manoeuvrability remains first class. The Zoom is suitable from 6 months as standard, but is compatible with the Risus Group 0+ car seats and the ABC Design Zoom Carrycots. Any combination of seat units, car seats and carrycots can be used at any time and changing between them is as simple as pressing a catch on either side. If you're looking for a tandem with the best versatility, practicality and usability then look no further than the ABC Design Zoom. With the awards year only just underway, this is just the start for Obaby and ABC Design with hopefully a lot more to come. 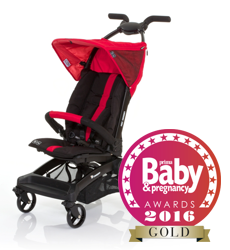 To find a retailer or for further information on both the current and past award winners, head over to the Obaby website. This is my first opportunity to visit this website I found some interesting things and I will apply to the development of my blog.